PURPOSE: Injury heterogeneity and specialized care for brachial plexus injuries (BPI) have made it difficult to estimate the annual incidence of BPI in the United States (US). Prior studies have not captured the national experience, relying on large single-center series or population-based estimates from limited states and years. Our objective was to provide an estimate of the national incidence of surgically-treated BPI in the US. METHODS: We used an administrative claims database (Marketscan) of privately-insured individuals to identify 966 patients who underwent BPI surgery from 2008-2014. Incidence estimates of surgically-treated BPI per 100,000 persons were calculated from total beneficiaries enrolled in health plans. 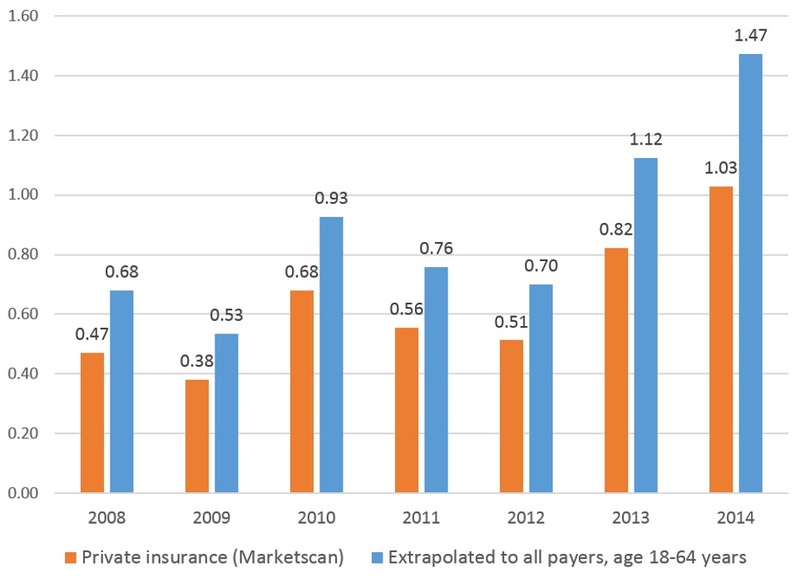 These estimates were extrapolated to the general population (all insurance types) between ages 18-64, based on proportion of privately-insured people included in Marketscan, percentage of US between ages 18-64 covered by private insurance, and a previously-published proportion of BPI surgeries covered by private insurance. The Cochran-Armitage trend test was used to evaluate for statistically-significant changes in BPI incidence over time among the Marketscan data. RESULTS: The average incidence from 2008-2014 of surgically-treated BPI was 0.64 per 100,000 (range 0.38-1.03) privately-insured persons in MarketScan; when extrapolated to all payers, the average incidence was 0.89 per 100,000 persons (range 0.53-1.47). Among privately-insured patients in MarketScan, there was an overall increase in surgically-treated BPI from 2008 (0.47 per 100,000 privately-insured persons) to 2014 (1.03 per 100,000 privately-insured persons), which was statistically significant (p<0.0001). CONCLUSIONS: The estimated incidence of surgically-treated BPI is 0.89 per 100,000 persons. There has been a notable increase in surgically-treated BPI from 2008 to 2014. This may reflect changes in injury epidemiology, but could indicate shifts in practice patterns and supply of BPI surgeons. CLINICAL RELEVANCE: This estimate will inform assessments of BPI disease burden for clinical and research resource allocation.